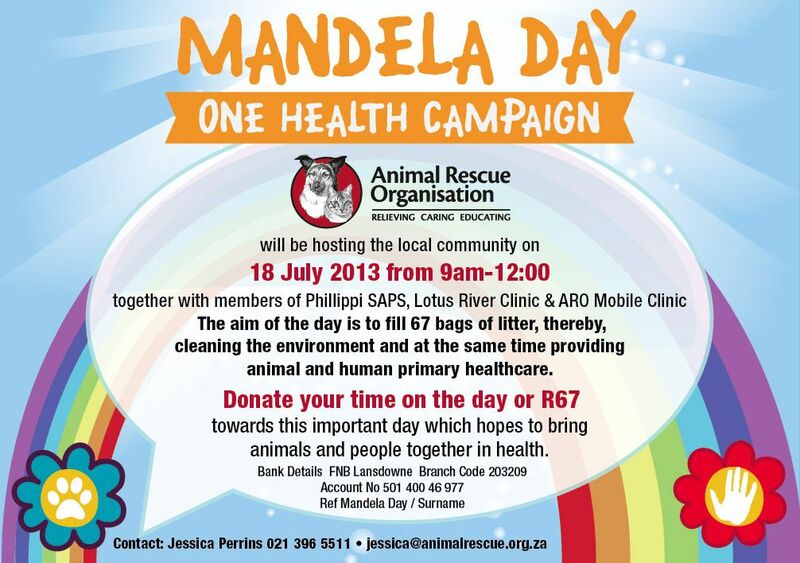 The Animal Rescue Organisation will be hosting “ONE HEALTH ON MANDELA DAY” on the 18 July 2013 from 9am – 12 at our Head Quarters in Ottery. This project is all encompassing as it includes animal healthcare, human healthcare and environmental sustainability. We have partnered with Phillipi SAPS and the Lotus River Health Clinic to make this day a success. Community members are invited on the day, we plan to host a litter clean up and on completion we would like to serve each member from the surrounding informal settlement / area a cup of soup and bread as well as provide every animal treated with a gift. Should the public wish to get involved, please contact Jessica Perrins 021 396 5511. Do your bit for Mandela Day – if you cannot volunteer your time, donate R67 towards this initiative! I look forward to reporting back on what we hope to be a very successful event and the first of many ‘ONE HEALTH’ days to come. This entry was posted in Donate, Upcoming Events and tagged Animal Rescue, Clinic, Environmental sustainability, Mandela Day. Bookmark the permalink.